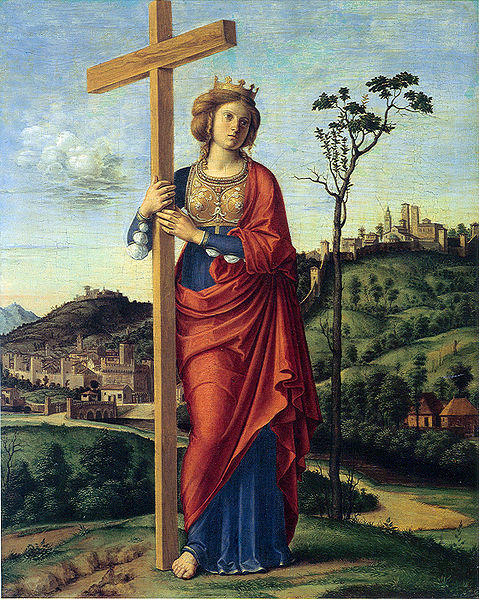 IT was the pious boast of the city of Colchester, England, for many ages, that St. Helena was born within its walls; and though this honor has been disputed, it is certain that she was a British princess. She embraced Christianity late in life; but her incomparable faith and piety greatly influenced her son Constantine, the first Christian emperor, and served to kindle a holy zeal in the hearts of the Roman people. Forgetful of her high dignity, she delighted to assist at the Divine Office amid the poor; and by her alms-deeds showed herself a mother to the indigent and distressed. In her eightieth year she made a pilgrimage to Jerusalem, with the ardent desire of discovering the cross on which our blessed Redeemer suffered. After many labors, three crosses were found on Mount Calvary, together with the nails and the inscription recorded by the Evangelists. It still remained to identify the true cross of Our Lord. By the advice of the bishop, Macarius, the three were applied successively to a woman afflicted with an incurable disease, and no sooner had the third touched her than she arose, perfectly healed. The pious empress, transported with joy, built a, most glorious church on Mount Calvary to receive the precious relic, sending portions of it to Rome and Constantinople, where they were solemnly exposed to the adoration of the faithful. Reflection.—St. Helena thought it the glory of her life to find the cross of Christ, and to raise a temple in its honor. How many Christians in these days are ashamed to make this life-giving sign, and to confess themselves the followers of the Crucified!